Many think that communicating science is a necessary and rewarding activity. Yet finding compelling, relevant, and timely points of linkage between challenging scientific concepts and the experiences and interests of the general public can be difficult. Since science continues to influence more and more aspects of daily life and knowledge, there is a parallel need for communication about science in our society. 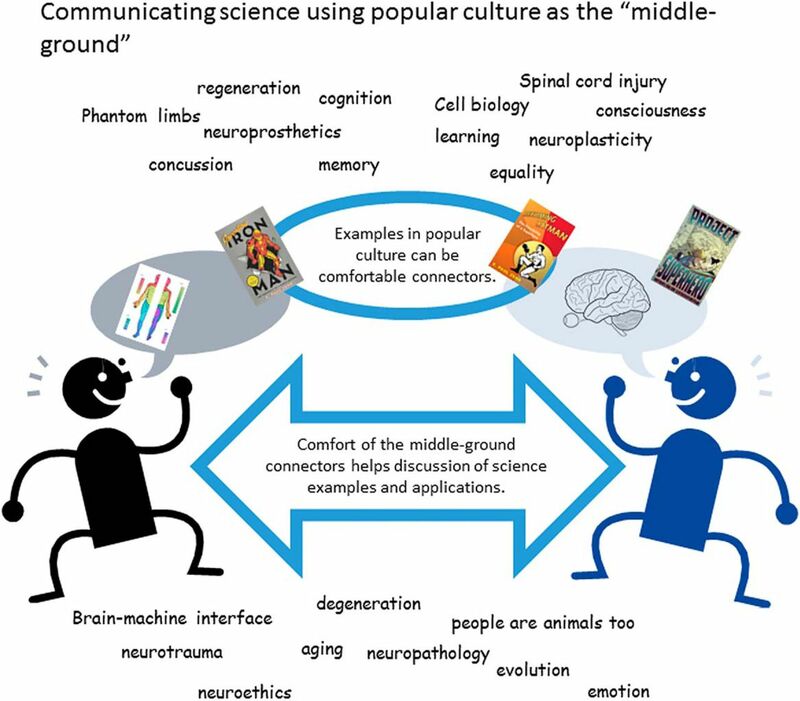 Here I discuss the “middle-ground hypothesis” using popular culture for science communication and applying the “FUNnel model,” where popular culture is used as a lead-in and wrap-up when discussing science. The scientific knowledge we find in our hands does not belong to us—we just had it first. We can honor that knowledge best by sharing it as widely as possible using the most creative means at our disposal. This commentary is based mostly on my own experiences using icons in popular culture to serve as vehicles for communicating science. For example, I used the Walking Dead to illustrate human motor control in a zombie context (Zehr and Norman, 2015), and Darth Vader to consider phantom limbs, embodiment, and neural prosthetics (Zehr, 2015a). The bulk of my work in this area, though, has been to use superheroes. These efforts have also led to advances in my own approach to undergraduate education. At the University of Victoria, I now teach a 100 level course “The Science of Batman” that is open to students from all faculties and departments with an interest in science and superheroes. I explored themes of plasticity in biological systems in “Becoming Batman: The Possibility of a Superhero” (Zehr, 2008), and the enhancement of biological function with technology in “Inventing Iron Man: The Possibility of a Human Machine” (Zehr, 2011b). Here, I will not talk much about the need for Science Committee—please see David Eagleman’s essay on its importance (Eagleman, 2013). Instead, the focus is largely on examples of science communication using pre-existing elements in society and popular culture. Acknowledgments: I thank the Society for Neuroscience for recognizing my efforts and honoring me with the 2015 Science Educator Award. I also thank the University of Victoria, which has steadfastly supported my science communication activities over the years, and my trainees for engaging in my message and doing their own outreach activities. In addition, I thank Hilary Cullen, Steve Noble, Yao Sun, Greg Pearcey, Trevor Barss, and Lee Bauer, who provided very helpful comments on earlier drafts of this manuscript. Last, I acknowledge the influence of Stan Lee, from whom I have learned to always help others if I have the chance. Doing so expresses a superpower we all possess. Editor’s Note: In 2003, the Society for Neuroscience initiated the Science Educator Award to recognize an outstanding neuroscientist who has made significant contributions to the education of the public. For a description of the award, see http://www.sfn.org/Awards-and-Funding/Individual-Prizes-and-Fellowships/Science-Education-and-Outreach/Science-Educator-Award. eNeuro has provided the 2015 winner, E. Paul Zehr, with an opportunity to write a feature commentary on science education. Zehr EP (2012a) Assembling an avenger–inside the brain of Iron Man. Sci Am. Available at http://blogs.scientificamerican.com/guest-blog/assembling-an-avenger-inside-the-brain-of-iron-man/. Zehr EP (2012b) Bumps and bruises from Bruce to Batman and beyond. Sci Am. Available at http://blogs.scientificamerican.com/guest-blog/bumps-and-bruises-from-bruce-to-batman-and-beyond/. Zehr EP (2013a) Fighting tooth and claw with Wolverine–examining the healing power of an X-Man. Sci Am. Available at http://blogs.scientificamerican.com/guest-blog/fighting-tooth-and-claw-with-wolverineexamining-the-healing-power-of-an-x-man/. Zehr EP (2013b) The Man of Steel, myostatin, and super strength. Sci Am. Available at http://blogs.scientificamerican.com/guest-blog/the-man-of-steel-myostatin-and-super-strength/. Zehr EP (2014c) Putting Rocket Raccoon's hippocampus into hyperdrive. Sci Am. Available at http://blogs.scientificamerican.com/guest-blog/putting-rocket-raccoon-s-hippocampus-into-hyperdrive/. Zehr EP (2015a) From phantom menace to phantom limbs: amputation, neuroprosthetics and Darth Vader 's brain. In: Star Wars psychology: dark side of the mind ( Langley T , ed). New York: Sterling Publishing 31–42. Zehr EP, Norman S (2015) Inside the head of the walking dead: the neurobiology of walker dysfunction disorder. In: The walking dead psychology: psych of the living dead ( Langley T, ed). New York: Sterling Publishing 31–41. 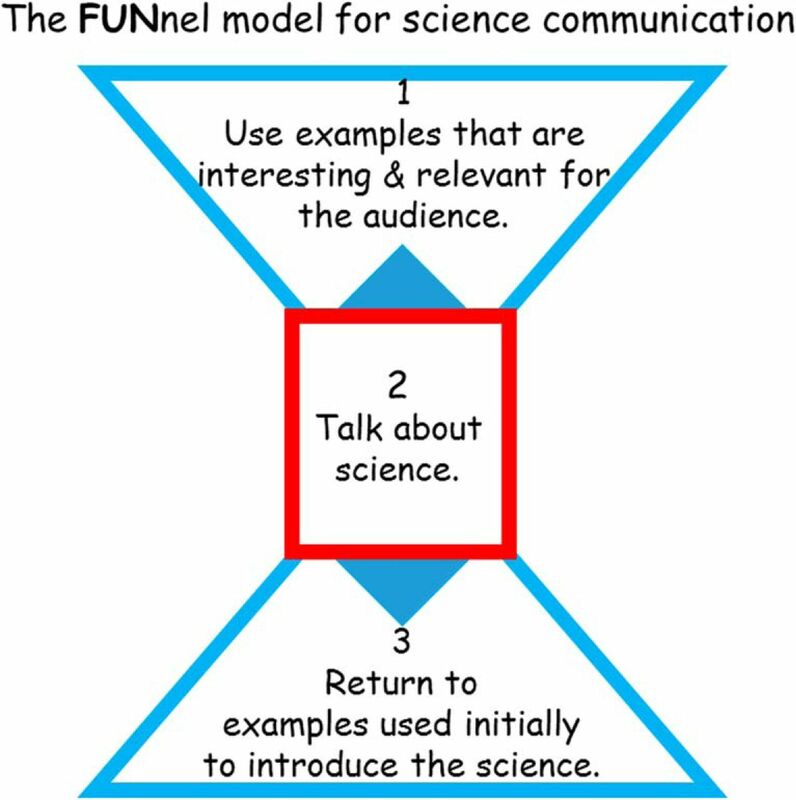 Paul Zehrs's article on science communication is a delightful read that does a first rate job of justifying the importance of science communication. Too often overlooked or looked down upon by established scientists Zehr provides not only reasons why this is an important activity but shows how a smart scientist can participate with the public while giving nothing up as a scientist - indeed I think while growing as a scientist. I applaud his efforts and this very readable and meaningful piece that I hope will influence younger scientists to take an interest in making their work accessible to the public. Erwin Schrodinger said, "If at the end of the day you cannot tell anyone about what you're doing, then your doing is worthless." Zehr lives up to that challenge. My only comment might be that figure 1 is not really very explanatory and the cartoonish quality of it takes away from the seriousness of the argument being made. The article is already lighthearted enough in the writing style.